This beautifully written study looks at the haunting, melancholy horror films Val Lewton made between 1942 and 1946 and finds them to be powerful commentaries on the American home front during World War II. Alexander Nemerov focuses on the iconic, isolated figures who appear in four of Lewton's small-budget classics—The Curse of the Cat People, The Ghost Ship, I Walked with a Zombie, and Bedlam. These ghosts, outcasts, and other apparitions of sorrow crystallize the anxiety and grief experienced by Americans during the war, emotions decidedly at odds with the official insistence on courage, patriotism, and optimism. In an evocative meditation on Lewton's use of these "icons of grief," Nemerov demonstrates the film-maker's interest in those who found themselves alienated by wartime society and illuminates the dark side of the American psyche in the 1940s. Nemerov's rich study draws from Lewton's letters, novels, and scripts and from a wealth of historical material to shed light on both the visual and literary aspects of the filmmaker's work. 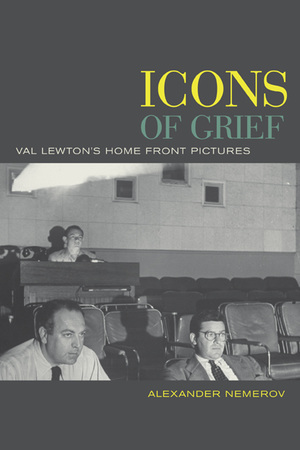 Lavishly illustrated with more than fifty photographs, including many rare film stills, Icons of Grief recasts Lewton's horror films as suggestive commentaries on a troubled and hidden side of America during World War II. Alexander Nemerov, Vincent Scully Professor of the History of Art at Yale University, is author of The Body of Raphaelle Peale: Still Life and Selfhood, 1812-1824 (California, 2001) and Frederic Remington and Turn-of-the-Century America (1995).